What type of projects are you after.... yard stuff... automotive... ? My webpage has a bunch, but not sure thats what your after..
Last edited by EdZep; 04-22-2008, 10:00 AM. Heres one for you guys, its to do with ventilation in your shop or garage to get welding fumes out. I use it it for welding fumes, plus my home made paint booth. Anyway the vents are insulated, because i live in Wi. But I also use an air conditioner once in a while in the summer. This is on the first five pages of this,http://www.1969supersport.com/paintroom.html the pictures are scattered around a little, but you can see the insulated vents. Anyway, for whats it worth. WOW I looked at the chevelle pics. Amazing work, I mean world class. Very nice. I'll play.. here are a few recent projects..
3 Made shelf brackets out of 1" flat bar and 5/8" square tube to put shelves up high in the garage and get the coolers, and other stuff off of the floor. 1 and 2, I've always wanted an older gas pump in the shop ( for looks)..
3 & 4 I picked up this drill bit sharpening jig at an auction a couple of years ago. This along with the motor out of the gas pump, an arbor and a grinding wheel turned it all into a drill bit sharpening setup.. It'll do until I improve my freehand sharpening skills. Last edited by 67chevelle; 02-14-2008, 06:05 PM. 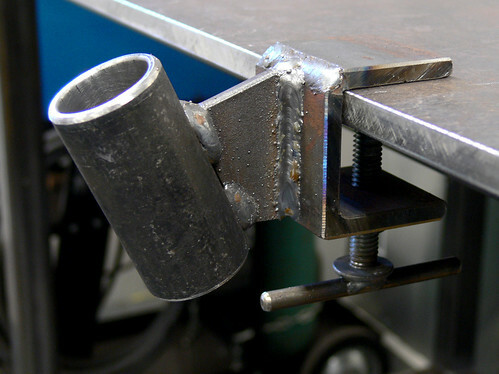 The last 4 for now..
Used some 2" and 2.5" 3/16 wall square tubing to make some brackets for mounting a removable bench grinder and vice on the end of my welding table into a receiver style setup. 2 is the receiver portion with hole for the retention pin and 2- bolts in tapped holes that when tightened take the slop out of the system. 4 grinder and vice stored out of the way so that the entire welding table is open. Yeah, I know i have way to much time on my hands, but it keeps me out of the tavern.